When people (artists and designers) refer to colour, they use several attributes of colour, terms that are used to define certain characteristics. These attributes can be credited to Albert Munsell (1858-1918) who first used them in his book “A Color Notation,” published in 1905 which is still in print today. In 1917, Munsell founded the Munsell Color Company. His colour-order system is known as CIE which is an abbreviation of International Commission on Illumination (Commission Internationale de L’Eclairage) located in Vienna, Austria. This system of colour is the same system that is used in most graphic applications and colour monitors. These attributes are listed here. Hue is the name of the colour family to which a colour belongs. A red-orange which would have more red than orange, would belong to the family of reds, and so its hue would be considered red. A word about colour gamuts: Gamuts refer to any device or software that can generate colour. A gamut is the range of colours that they see or produce. Your eyes see in RGB as do most devices, such as camcorders, video, television and your computer monitor. 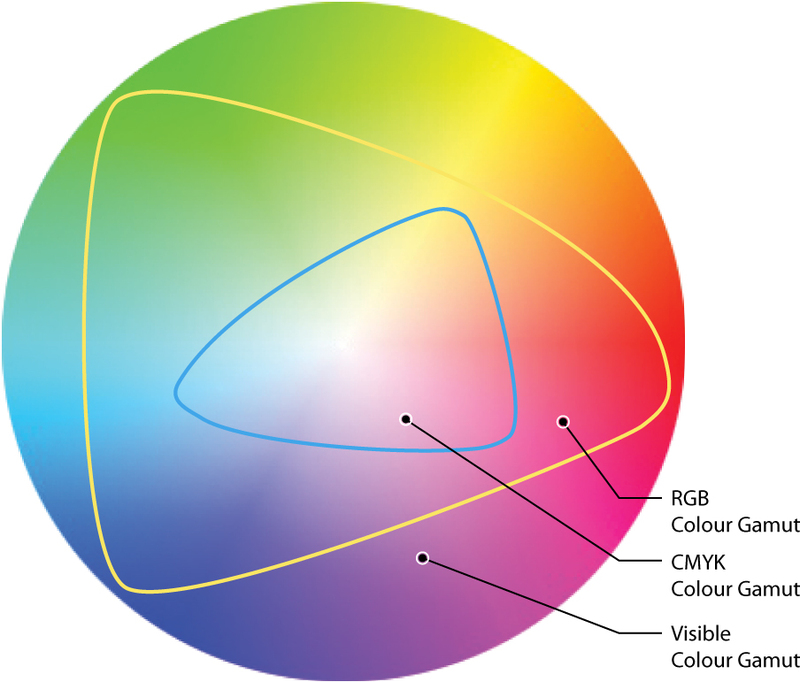 People who work in print, work in the CMYK gamut (Cyan-Magenta-Yellow-Black), which is named for each of the colour plates that are used in printing. The CMYK colour gamut is contained within the RGB gamut. This means that all CMYK colours can be made in the RGB gamut, but not all RGB colours can be made in the CMYK gamut. This is also why your computer monitor can display CMYK colours without the aide of software or hardware. For people who work in colour, it’s important to realize that some of the more brilliant and intense colours available in RGB, cannot be created in things like paint or print. People who work on the web, on the other hand, work in RGB and have the full RGB colour gamut at their disposal. Anyone who has converted colours (or re-assigned colour profiles), can attest to the fact that the first thing that changes is the intensity and brilliance of RGB colours to CMYK. Those colours are converted to their closest match within the CMYK gamut. A value of a colour is how dark or light a colour is. 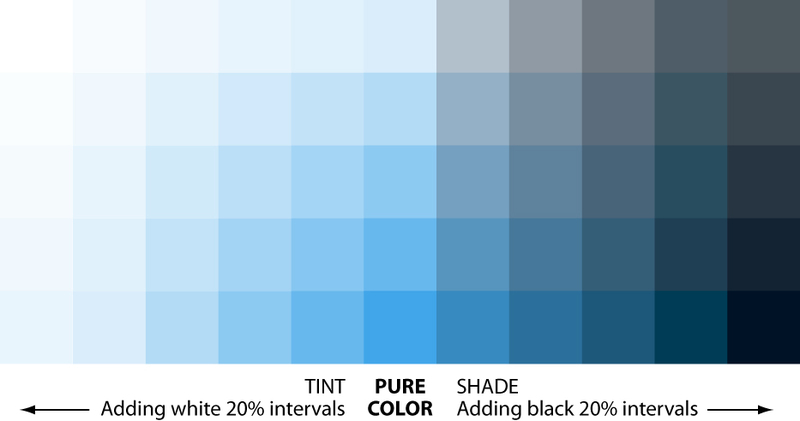 The value of any colour can be altered by adding white, creating a tint (which raises the value), or black, which creates a shade (which lowers the value). Chroma refers to a colour’s purity. The stronger or brighter a colour is, the higher its chroma. The weaker or more mixed a colour is, the lower is it’s chroma. You can alter the chroma of a colour by adding white, grey, another colour or black. Chroma is also called saturation. Colour has the ability to advance toward a viewer or appear to recede away. The rule of thumb has been that warm colours advance and cool colours recede. Think of it this way… warm colours as in those in sunlight and the blues in your background that create depth. 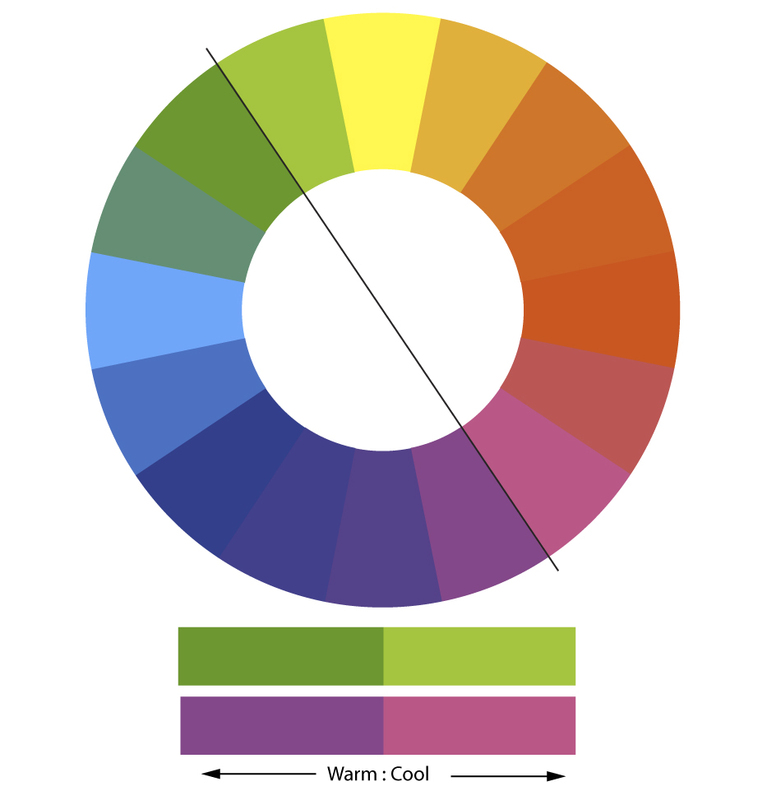 Colour temperature is strongly linked to colour depth. The same rules apply here. Warm colours appear to have a radiant heat and cool colours appear to generate a coolness. Here’s the controversy regarding warm and cool colours: Many people can’t make up their minds which colours should be considered warm or cool. This is an argument that’s been raging for centuries. Some people quite simply, split the colour wheel in half into warm and cool. Others apply a general rule of any colour that contains red, is considered warm. Personally, I don’t believe any of this. Green has the ability to be warm (lime) and cool (aquamarine). And you know what? So does magenta. The above colour harmony was created using the middle magenta hue as a base. The intent was to create a colour harmony that evoked a cold feeling, which it does. My point is that both magenta and green straddle the warm-cool boundary. They are the only ones that have that ability. This is why I see them as intermediate colours that can blend into warm or cool. Rich, saturated colours can appear heavy and heavily tinted colours can appear light. Colour can create movement by changing tonal values. Although this characteristic is strongly linked to geographical location and culture, there are very basic symbols that cross cultural borders such as blue representing sky or red representing fire etc. Paint a small room in dark, dense colour and the room will appear smaller, paint it in a pastel colour and it will appear larger. You can see it happening here. The red square on the left appears larger than the one on the right. It seems to be almost bulging. The black square on the right seems a little smaller and the red seems to somehow swell. The more radiant (saturated) a colour is, the more it will “swell” or appear larger. A red outline around any dark shape on a light background will soften its edge without blending it in. The red outline enhances (reduces) the shape’s contrasting edge. At the same time, colours that gradate to white (or a distance colour) on the edge of a shape will enhance the form by creating more depth. Actually, it’s with the people who categorize colours or teach colour theory. According to Wiki, Magenta isn’t really considered a colour because “It is an extra-spectral color, meaning it cannot be generated by a single wavelength of light, being a mixture of red and blue wavelengths.” For this reason, Magenta has been put on the same shelf as the now non-planet Pluto. Magenta, according to this definition, is a non-colour. I strongly disagree and I’m going to tell you why. As a painter and illustrator, I like colour charts. I’m fascinated by them, strange but true. Most people know of the basic 6-colour chart. Inaccurate if anything. In my world, I use 2 “blues” and 2 “reds”… cyan, blue, red and magenta. I use cyan because blue and yellow won’t make a green, but cyan and yellow will. I use magenta because red and blue wont make violet, but magenta and blue will. 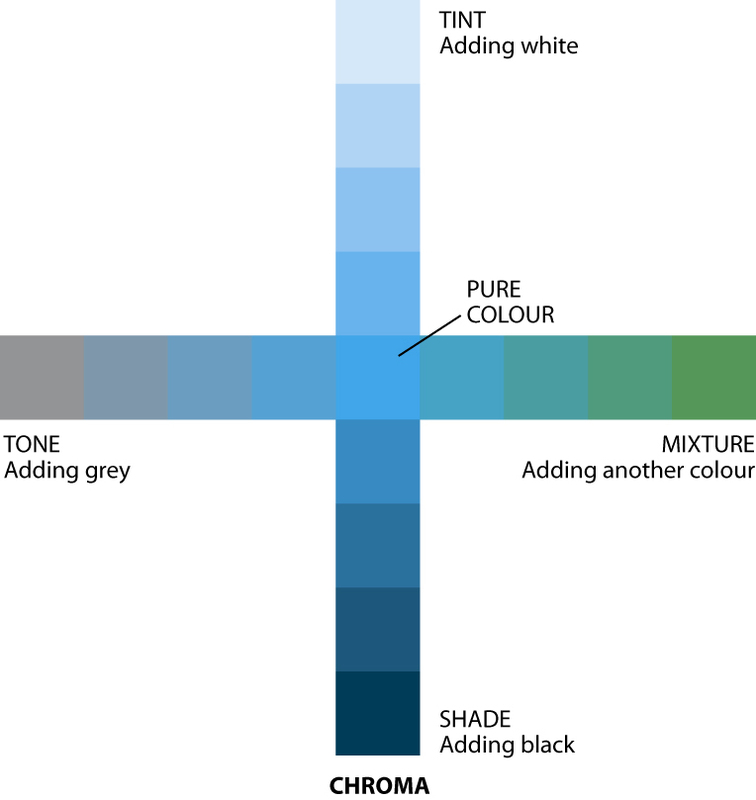 This is the basic 6-colour chart that most people are familiar with. I’m here to tell you this is completely wrong. Below is what you would actually get if you mixed these primaries (yellow and red, red and blue, blue and yellow) together. Tell me there isn’t something horrifyingly off here. Why do we teach this wheel to our kids when it clearly is so wrong in the first place? No wonder so many people grow up afraid of colour in North America. How do you get a cyan, a hot pink or a bright green? You can’t. As you can see, they don’t look like anything like they’re supposed to look. It’s also the reason why if you google “color wheel” in the image section of Google, the resulting hits have colours that are all over the place. The greens are either too electric or too dull, most colour wheels don’t even have magenta or cyan in them and the blues are so out off-base, there’s no way you could mix a violet from them. In most cases, the colours have actually been “fudged”. And it’s not just on the net. It’s everywhere people are teaching colour theory. Here’s one sold as a “guide to mixing color”. Many creative people are familiar with this one as are most art students. The first thing I notice is its actually a 6-colour wheel (3 primaries, 3 secondaries) with tertiaries. 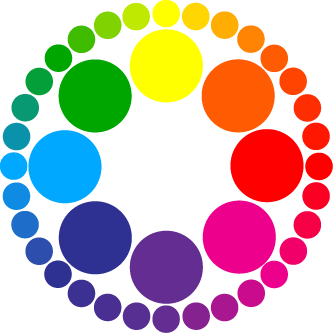 The second thing is if you were to point to all the major colours not including tertiaries, you should see a logical pattern… like skipping over every other colour all the way around the wheel. But you don’t. Starting at yellow, you skip over yellow-green to get to green, skip over blue-green to get to blue, skip over blue-violet to get to violet and then from there it falls apart. The next colour red-violet. If you skip it, then you’re omitting a purple from your collection of major colours… but you’ve been skipping over every other colour when you started. Do you leave it out? This discrepancy is because there is no magenta in this wheel. If you take an even closer look, you’ll also notice that some of the major colours are wrong… primaries and secondaries. Violet is actually blue, blue is almost cyan but contains too much magenta. There is no way you could make this particular red violet using this red and violet. Even the yellow contains too much magenta in it to mix these oranges. The primary green appears too blue which puts all its mixes into question as well. Let me show you what I mean. 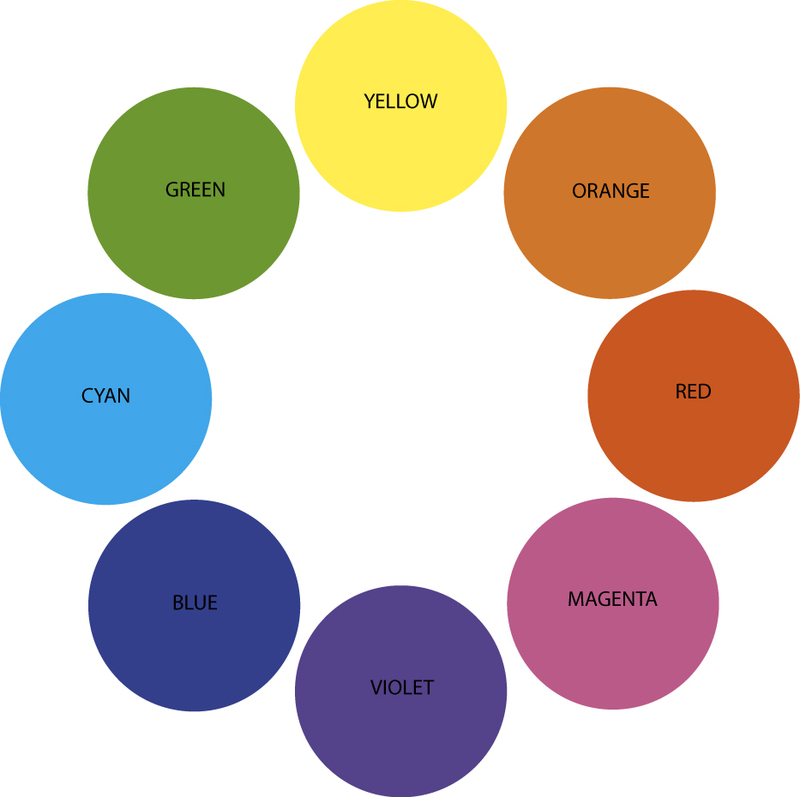 The small circles outside the wheel are the actual colour mixtures you’d get if you were to use this colour wheel. The mixtures that this chart claims to make are clearly wrong. In some cases (red-violet, blue-green, red-orange) very wrong. These colours have been inaccurately stated here. The bars running around the rim are the corrected colours showing how far off the samples are. The blue has too much red in it to work as a primary colour. (The whole idea of a primary colour is that it is pure, with no other colour in it… a colour that cannot be mixed from other colours.) Their blue is more of a mixed colour, than a primary. Same is true for violet, red, yellow and green. Finally, and perhaps most importantly, there is no magenta in this wheel. Without magenta, how is their violet plus their red supposed to produce that red-violet? It’s impossible. The small circle shows you what you would really get instead. But wait a second, we’re not talking about the six basic colour wheel that they teach to kids here. This is sold to art students! And it’s clearly wrong! Again, these colours have been fudged. They are not in any way accurate colour mixtures. This is my colour wheel. 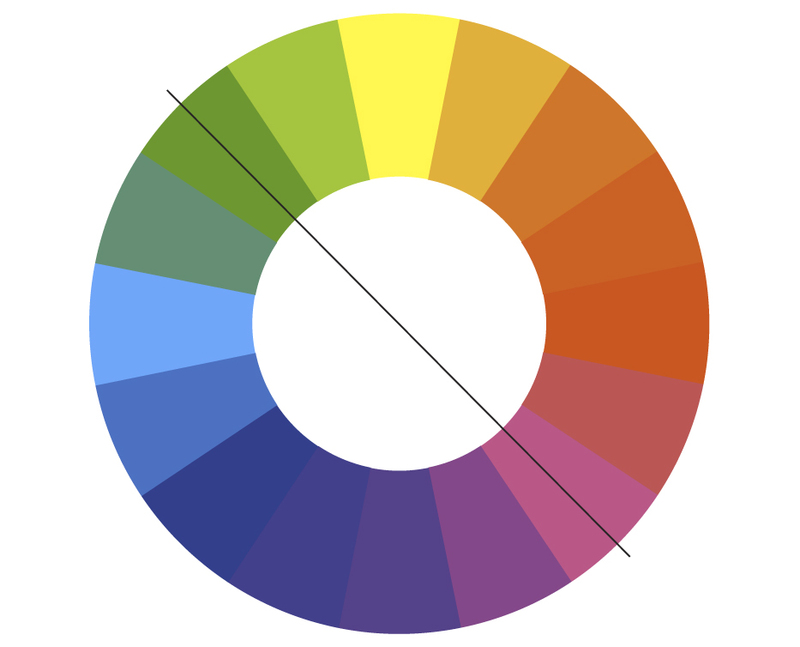 Designers and artists know it as the artist’s colour wheel. You can easily see how blending one colour with another two doors down would result in the colour shown. It makes perfect sense and each colour can clearly be imagined blending into to one another to create the appropriate hue it should. Now this colour wheel should make (visual) sense. You can clearly see how you can now move through this colour wheel to reach the next (logical) hue. This is what we should be teaching our kids. The 6-colour basic wheel is nothing more than bunk and nonsense. I say if you’re going to teach anyone colour, teach it properly and include magenta (and cyan) in the lesson. Magenta and cyan occur in nature so we know the colours exist naturally. Having said that, I realize that what the Wiki definition is really saying; is that when we split white light using a prism, magenta doesn’t show up as a separated colour. In fact, it doesn’t show up at all. That’s because magenta doesn’t have a wavelength attributed to it. I get that. I also get that some people refer magenta as an imaginary colour because of it. But I don’t buy it. That’s like saying that we’re all imagining the same colour at the same time. It cannot be imaginary if other people are seeing the same thing as you are. That sentence simply does not make sense to me. It’s also possible that its just poorly labeled. I think its because magenta’s wavelength is possibly too low to register like the other colours in the spectrum or that we simply haven’t come up with the best reason why this is. To call it imaginary or that it doesn’t exist as a colour is simply, in my mind, misleading in an already misled, misinformed and misunderstood subject. All I know is without it, I can’t create certain colours which makes me believe these colours couldn’t exist without it (take that Wiki!) So I refuse to call it imaginary, wavelength or not. I say teach everyone the same colour wheel, the same colour theory. Don’t fudge the colours in printing just because you don’t believe enough in your own product. Colour theory is easy. It’s not complicated. Understanding it is easy as long as you are being taught what really happens in nature. It should make sense and not be polluted with someone’s (incorrect) idea of what he or she thinks we’ll be able to grasp. People are smart… and colour is easy. When it comes to colour (theory), there are three things that I have always found intriguing in both design and painting: colour influence, the after-image effect and partitive colour. Note: Even though Rothko was classified as an abstract expressionist, he hated the term and classified himself as an “abstract painter”. I personally place him squarely in the realm of colour field painting. In the sample above, you can clearly see how Rothko took great care in choosing each hue. Even the background is selected with great care and to great affect. The purple cast plays a primary role here and makes the Burnt Sienna tones “pop” due to the yellow in the sienna reacting with the background. The dark Prussian blue which is mixed with just enough green to give the colour a greenish cast, making it pop as well, because it’s also reacting to it’s dark plum background. The top bar, painted in muted reds, browns and violets has bits of red, making it link to the red in the background analogously and stabilizing the two lower bars because optically, it appears just slightly larger than the other two bars below it. The overall effect is that of enhancing and punching up color hues a notch or five. The after-image effect is related to colour influence but on a more physical side. The after-image effect is something that happens to everyone on a bright sunny day. When you look at the sun and then go indoors, you are momentarily blinded. The rods and cones in your eyes are fully saturated with so much colour, you can’t focus for the first few seconds. Coming in from the brightly lit outdoors, the inside of your house will appear in shades of blurry grays and blacks. A few seconds later your eyes clear and you can see again. What you were seeing is actually the opposite colour to the brilliant colours from outside. You can make it happen too. Above are two images. If you block the other images and stare at the first blue image with the green chair for 30 seconds and then do the same to the red image, you’ll see the effect. The result is actually quite predictable. You should see a pink glow around the blue chair as you stare at the second image. That is the after-image effect. Your eyes are trying to adjust to seeing more saturated colour than they can handle by creating the effect. The pink is exactly halfway between these two colours so you see a pink or magenta glow around the green chair. 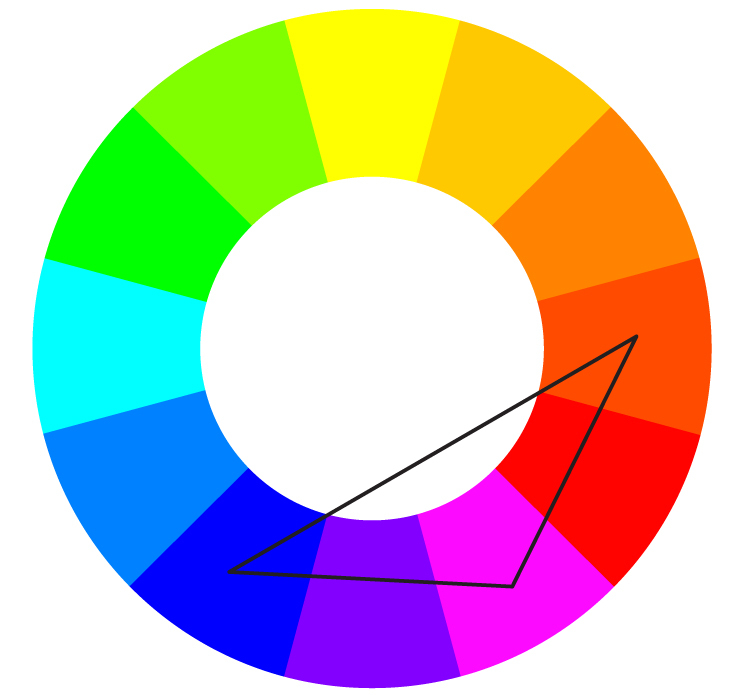 This colour wheel matches the RGB gamut used in the images above it. Partitive colour is something we’ve all seen before. We see it in printing when printers use coarse screens and it’s the basis behind the short-lived pointillism movement in painting from the 1880’s. Also known as retinal mixing, it’s what happens when you look at small points of pure colour blended with other points of pure colour. Your eyes create the intended colour by optically mixing. It’s a remarkable effect when you think about it. Interestingly, you can’t stand close to these images to see the effect, but far away. (Think comic books of the 60s or Roy Lichtenstein). Here is what you’re actually seeing. The first image is a close-up, the second is from viewing at a distance and the third image is what your eyes “think” they are seeing. In printing, this is an example of a typical application of partitive colour. To see this image clearly, take three steps back.